President Donald Trump greets guests on the tarmac as he arrives at Greenbrier Vally Airport, in Lewisburg, W.Va., Feb. 1, 2018, to speak at the 2018 House and Senate Republican Member Conference at The Greenbrier. A White House official says President Donald Trump plans to approve the release of a classified memo alleging that top law enforcement officials were biased against the president. The official says the president is “OK” with it and will likely inform Congress of his decision Friday. The official said it would likely be released without anything edited out. Trump is at odds with both the FBI and the Justice Department over whether to make the memo public. Early Friday morning, Trump posted on Twitter: "The top Leadership and Investigators of the FBI and the Justice Department have politicized the sacred investigative process in favor of Democrats and against Republicans - something which would have been unthinkable just a short time ago. Rank& File are great people!" Few people outside Congress have read the “Nunes memo,” named for the Republican congressman who drafted it. It allegedly includes details about Justice Department efforts before the 2016 U.S. presidential election to seek authority from the Federal Intelligence Surveillance Court to monitor a Trump campaign adviser’s possible contacts with Russian operatives. U.S. Representative Devin Nunes (R-CA), chairman of the House Freedom Caucus, listens as President Donald Trump addresses the Republican congressional retreat at the Greenbrier resort in White Sulphur Springs, West Virginia, Feb. 1, 2018. Democrats and other critics of the memo say it selectively uses classified intelligence to allege the Russia investigation is affected by political bias. Democrats have prepared their own memo, countering the Republican claims, but that memo is not expected to be released until later, if at all. 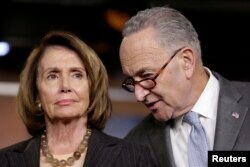 The top two Democrats in Congress, Senate minority leader Charles Schumer and House minority leader Nancy Pelosi, denounced the memo Thursday and criticized Republican leaders for allegedly putting partisanship ahead of the rule of law. The Democrats called for the removal of House Intelligence Committee Chairman Devin Nunes over his role in creating the memo. The partisan dispute has also drawn in the FBI. The bureau has issued a highly unusual public statement, saying it had “grave concerns” about the accuracy of the memo. FILE - House Minority Leader Nancy Pelosi (D-California), left, and Senate Minority Leader Chuck Schumer (D-New York) speak during a briefing on Capitol Hill in Washington, Nov. 2, 2017. One former FBI official still in touch with colleagues at the bureau, who spoke to VOA on condition of anonymity, said the reputation of the FBI is at stake in the dispute over release of the memo. It said the FBI remains “focused on our important work to protect the country from terrorists and criminals.” The association says FBI agents take an oath both to the country and to the Constitution. “The FBI is intimately familiar with ‘material omissions’ with respect to their presentations to both Congress and the courts, and they are welcome to make public, to the greatest extent possible, all the information they have on these abuses,” Nunes said in a statement. Special Counsel Robert Mueller departs after a closed-door meeting with members of the Senate Judiciary Committee about Russian meddling in the election and possible connection to the Trump campaign, at the Capitol in Washington, June 21, 2017. The memo concerns an application by U.S. law enforcement authorities to the surveillance court to monitor contacts Trump campaign adviser Carter Page may have had with Russian operatives leading up to the election. Some Republicans say the surveillance request may have been mishandled and suggest the episode could undermine special counsel Robert Mueller’s investigation of Russian meddling in the election and whether Trump obstructed justice to try to impede the probe. 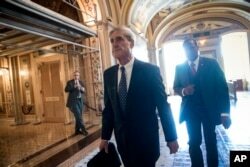 The memo has become a flashpoint in politically divided Washington, with some Republicans increasingly voicing complaints about Mueller's months-long investigation and claiming that some Justice Department officials have worked to undermine Trump's presidency. Trump has repeatedly said there was "no collusion" between his campaign and Russia. Last week, he said there also was "no obstruction" of the Russia investigation. National Security Correspondent Jeff Seldin contributed to this article.